But only in theory. Lucy Maud Montgomery may have had a better handle on how to get her words in print. I alas, too often hit a wrong key when I am on my last sentence and out the window goes my brain work. That’s what happened last time I wrote a blog post. It set me back to no writing at all — the the possibility that I posted this very title and not content. 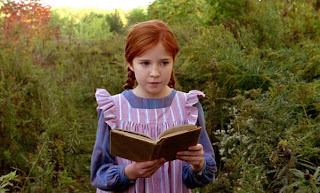 I wanted to say that I had the night before lucked into a TV showing of Anne of Green Gables, my all-time favorite. Worth losing sleep. I’m sure I’m not alone in finding inspiration whenever it is my good fortune to walk on famous writer’s ground. Twice I have visited Ms Montgomery’s Silver Bush “one of the happiest spots in the world” on Prince Edward Island. Even took a carriage ride over the property and enjoyed fresh-baked molasses cookies and tea in the museum run by Campbell relatives. The video scene where Anne and her best friend/neighbor stood on those unusually red cliffs prompted me to seek out my photos. Could have been the exact location. Nicholas Sparks and an old Jeanette Oaks (final in one of her many series) on my i-pad 2. I loved the “book feel” of turning pages so much I’ve read Sparks twice. But meantime, my daughter, Marti, has filled this online “bookshelf” with shelves and shelves of old children’s books. Some sounded so quaint in language style we laughed our heads off reading aloud to each other. An anonymous version of The Three Bears was amusing and one we’d never read. The illustrations, alone, dated it to at least back to my childhood or earlier. In public domain, these are freebies. price, but I know I’ll love the chapter beginnings and endings so carefully crafted–by me. And then there’s that wonderful page turning feel. If anyone reading this gets to it first, please report in.